BioAstin Supreme is a unique and powerful `Super Carotenoid Complex` with powerful antioxidant benefits. It has been shown to be 550 times stronger than Vitamin E and 800 times stronger than CoQ10. In addition to this, of the approximately 700 known carotenoids, which include the familiar beta carotene, lycopene, zeaxanthin, and lutein, BioAstin Supreme is the king. 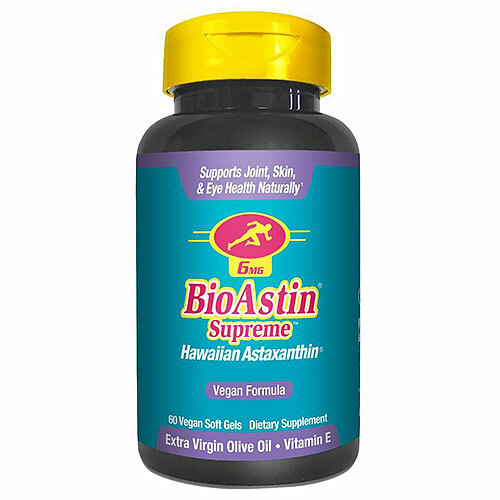 BioAstin Supreme is called the "functional antioxidant" because it does so many positive things for so many people. Non-GMO modified cornstarch, Carrageenan (seaweed), Glycerin (vegetable), Sorbitol, Purified Water, High Oleic Safflower and/or Sunflower Oil, Natural Tocopherols. Take 1 - 2 vegi-gels per day with meals. Below are reviews of Nutrex BioAstin Supreme - Astaxanthin - 60 x 6mg VegiGels by bodykind customers. If you have tried this product we'd love to hear what you think so please leave a review. I have already given this product five stars. 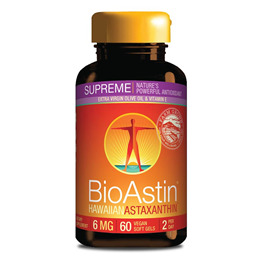 Astaxanthin is an amazing supplement which few people recognise. I have been taking it for quite some time now and I know it has increased my immune support. I also have a wonderful memory which seems to expand as time goes by. This brand of supplement from Bodykind is great. It is from a vegetarian source which I approve of, a fair price and excellent quality. I highly recommend it. Hi there! I bought this for my dad's osteoarthritis and it has stopped the pain and inflammation in its tracks. No joke, after the first capsule, within 30mins his pain was dissipating. This is highly recommended. I have him taking 2 of these capsules per day and he has told me he has not felt this good and pain free in over 10 years. Please bear in mind that prior to this my dad has had ankle fusion and a hip replacement for arthritis. His knee was also causing him problems recently hence the reason I thought that enough is enough. Astaxanthin works for my dad and for 20 quid I think it's worth a try if you are in a similar situation. BioAstin Supreme is a unique and powerful Super Carotenoid Complex with powerful antioxidant benefits. It has been shown to be 550 times stronger than Vitamin E and 800 times stronger than CoQ10.